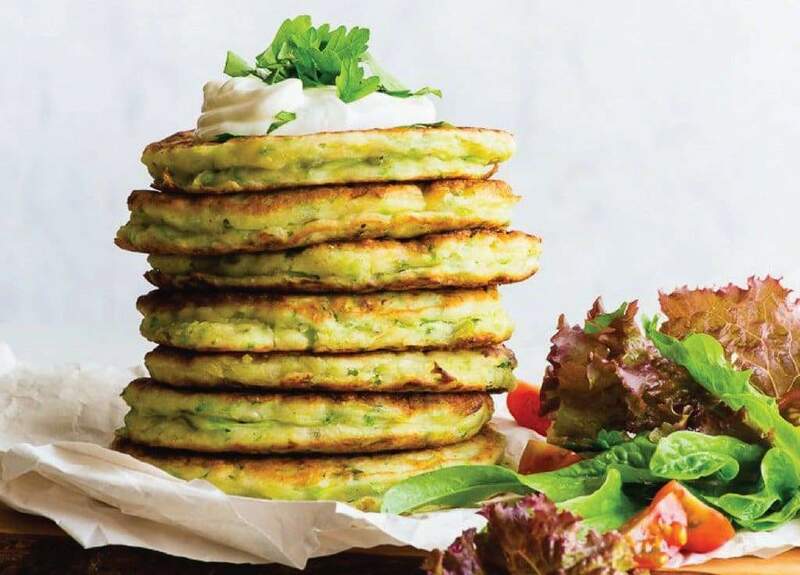 Healthy, easy to make and absolutely delicious, these gluten-free zucchini fritters make the perfect summer lunch! Coarsely grate the zucchini, then place it in a sieve above a bowl and allow some of the excess liquid to drain away. To speed up this process, press onto the grated zucchini with a spoon or spatula. You should get ~1 cup of drained water/liquid. 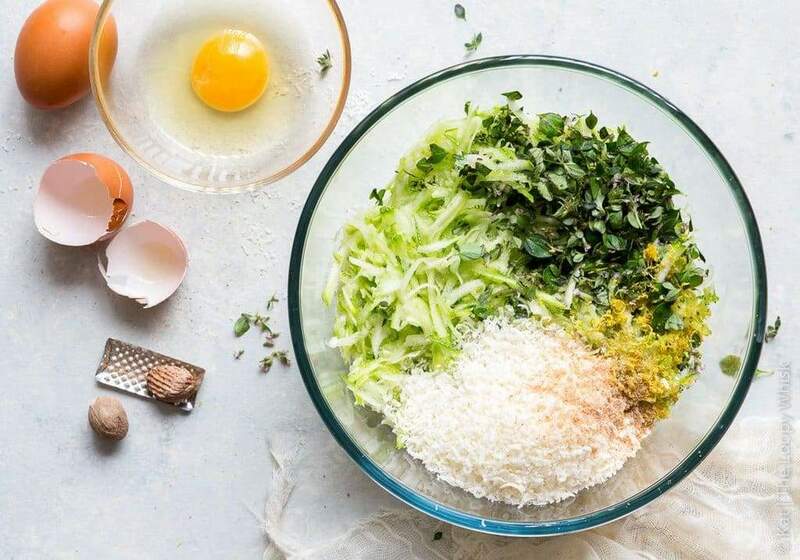 Add the parmesan cheese, thyme, salt, pepper, nutmeg, lemon zest and eggs. Mix well. Add the gluten free flour, xanthan gum and baking powder. Mix well until no flour clumps remain. If the mixture is too liquidy, add more gluten free flour (1 tbsp at a time). Heat up a large non-stick skillet/pan until very hot, then add 1 - 2 tbsp of oil of choice. 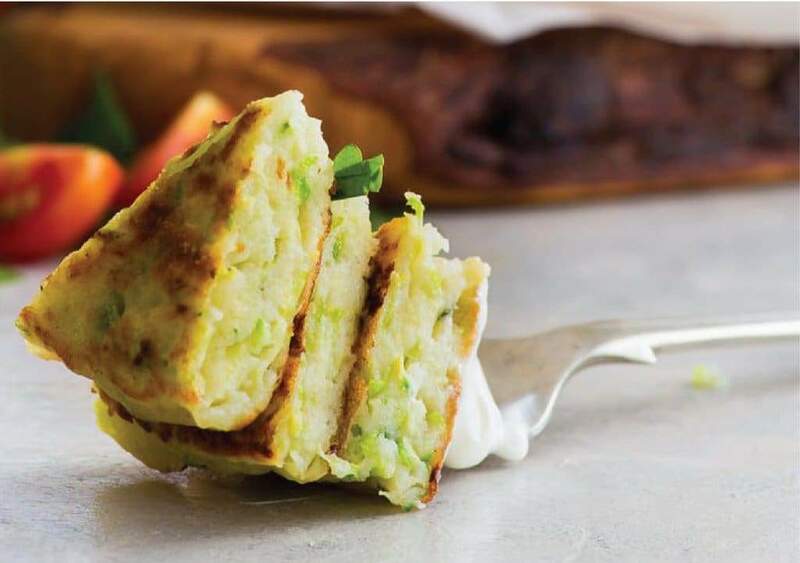 Scoop 1/4 - 1/2 cup of the zucchini fritter mixture and cook until the underside is deep golden brown, about 2 minutes. Flip and cook on the other side for a further 2 minutes. Serve immediately, with a dollop of yoghurt (greek yoghurt, or a soy alternative with a squeeze of lemon juice work wonderfully! ), a sprinkling of chopped parsley, or a side of salad. You can follow us on soical media for more daily content of both inspiring and entertaining value. TOG rating products type ambient/room temp. *please allow 1-2 cm difference due to manual manufacturing. 14 cm / 5 1/8"
14,5 cm / 5 1/2"
15 cm / 5 3/4"
15,5 cm / 6 1/8"
Cotton rompers are soft, made with breathable fabric that's ideal for your baby's delicate skin. It’s also incredibly easy to care for and stays soft wash after wash—two qualities every parent loves in a fabric. Set machine to a normal cycle. Select cold for colors and warm/hot for whites. Before placing items of like colors in the machine, zip all zippers and snap all snaps to prevent the fastenings from snagging. Also, for the same reason, avoid washing your items with anything that has Velcro on it. Once the cycle is finished, remove items promptly from the washing machine. Tumble dry on low. To spot clean a stain, mix chlorine-free bleach with water to create a pasty substance and gently rub into the stain with a toothbrush or stain brush. To soak a stain, fill a sink or basin with hot water and chlorine-free bleach. Soak items for at least one hour. Rinse dirty water and repeat if necessary. Fill a basin with warm water and add .5 fl. oz. of your laundry detergent. Mix the water and detergent, using your hands to gently agitate your item. Soak for one hour. Do not worry if color appears in your water, this is normal. Run cool water through item until rinse water is no longer soapy. Squeeze or push out the water. Hang to dry, lay flat, or tumble dry on low. Do not dry any items that still have stains.